Downtown Austin as viewed from Lake Bird Lake in 2013. A groundbreaking, new study just released by the USGS (United States Geological Survey) definitively demonstrates the positive watershed effects of a ban of coal tar pavement sealers. 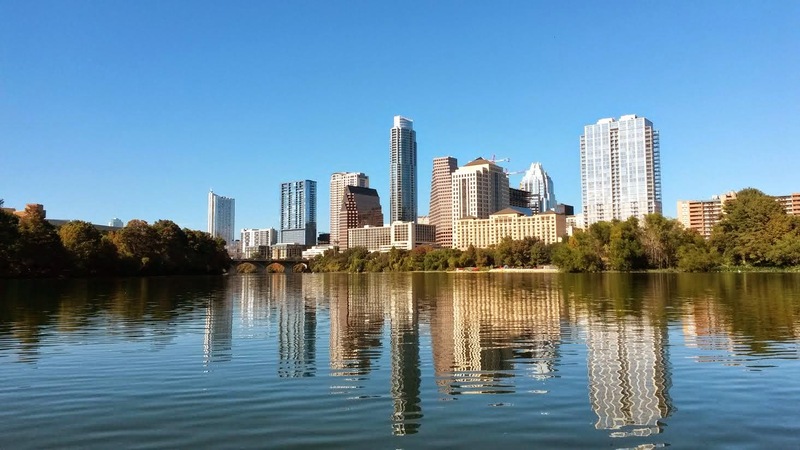 For the first time, the study results showed, in the latest version online edition of Environmental Science and Technology, that the levels of polycyclic aromatic hydrocarbons (PAH) are dropping in the sediment of Austin’s major receiving waterbody, Lady Bird Lake. Named for the former First Lady, Lady Bird Johnson after her death in 2007, the Lake, formerly known as Town Lake, is the focal point of Austin’s love affair with the outdoors. There is a constant, but relaxed presence of all types of non-motorized boats. Perspective of Lady Bird Lake looking westerly and showing much of the City drains to the Lake. The enjoyment of Austin’s waters was tainted in 2003 with the discovery that the trend from the USGS of PAH levels were rising while other legacy industrial chemicals were in a state of decline. Austin placed much of the blame on pavement sealcoats, the dark coating used to beautify and protect asphalt parking and playground surfaces. Many pavement sealers are made with toxic coal tar pitch, which is an abundant source of PAHs. As a result, Austin became the first city in the US to ban the material in 2005. The recent study included 5 different years of sampling from 1998 to 2014 and showed that in two out of three locations the drops were dramatic. The mean reduction in the lower lake area was 58% when comparing pre-ban samples (1998-2005) to later post-ban levels (2012-2014). USGS graphic showing decline in PAHs after the coal tar sealer ban in Austin went into effect in 2006. This USGS graphic contrasts the declining levels of DDT and PCBs with the increasing levels of PAHs nationwide. The PAH graph will need to be updated to reflect a limegreen down arrow in Austin, Texas! To be honest this is more of a vindication in the face of industry criticism. When Austin debated its ban, an industry spokesman said that the “cure (ban) would be worse than the disease” and predicted a worsening of the quality of Austin’s waters. In 2006 GemSeal, a major producer of coal tar sealer, unsuccessfully petitioned the State of Texas to overturn the ban by claiming that Austin’s ban was based on faulty science. It said that there were too many other sources to the Austin environment, but Austin contended that coal tar pavement sealers represented a significant, controllable source. By the way, the other sources of pollution have continued to rise in Austin with its population nearly increasing 50% since 2006. A summary of the State’s findings can be found here. Two and a half years later the PCTC sponsored a study which erroneously showed the ban was ineffective in reducing PAH values in Austin’s creeks. Even though this was years before anyone would expect any result, the industry perpetuated the “no effect” myth throughout its legions and has used it as a major tool to defeat bans legislation across the country. On several occasions experts in PAH research have gone on record to estimate when these benefits would begin. In 2010, the USGS said that coal tar pavement sealers will take at least 15 years for the concentrations to decrease in half. This is based upon the decline found with other persistent chemicals after their use stopped. With 2012 data, Scoggins told attendees of a webinar that some positive trends were being found, but not an overall clear picture. The focus of the USGS work is on a watershed basis, but for most humans the exposure to coal tar sealers are found on or near the parking lot surface. The sooner the material is gone from the parking lot surface, the greater the reduction in health risk. The more we’ve learned, the more a sealant ban could be compared to the physical benefits of when quitting cigarette smoking. Most likely you heard that physical healing and restoration happens after a smoker quits. More specifically, improvement can be immediate, some will take a few years, and others can take as much as 20 years. For example it is reported that within 20 minutes from quitting smoking, there is a reduction in the smoker’s blood pressure. One immediate benefit from ceasing the use of coal tar sealers is the reduction in air emissions during application. Look at USGS’s analysis of volatilization which showed massive airborne discharges of PAHs from freshly applied coal tar sealants in the first 24 hours. In other words, the product drying conditions cause a rush of toxic PAHs above it. One acre of curing coal tar sealant meets a toxic release standard of 1 pound of the most toxic PAH, benzo(a)pyrene in 24 hours. However, a coal tar sealant ban can be like quitting but living with a smoker and being exposed to second hand smoke (see Thank You for Not Sealing). While the intensity may not be the same, exposure to sealant dust and debris will continue for years as the old sealer wears away. The best solution is to remove the ongoing source of exposure through shotblasting (see What to Do if CTS is on My Driveway?!). That link also discusses the second best approach to minimizing exposure is to put a non-coal tar sealer on top of it. So today we celebrate the good news that Austin and any community can rejoice in: regulation, in the absence of industry action, can have positive, lasting impacts for any community and its environment. Thank you to all who played a part from the local, state and federal officials to Congressman Doggett who has worked to address this pollutant of concern for more than a decade.